If you’re an indie author, then you’re probably already aware CreateSpace is getting absorbed by KDP. However, the rest of you probably have no idea what that means. CreateSpace is a print-on-demand company owned by Amazon that helps creators produce and sell their work, whether that be CDs, books, or DVDs. I use them for my paperback books, so I’ve uploaded each cover image and PDF of the interior for all of my novels to their website. When someone orders my books, CreateSpace prints a single copy of that title and ships it to them. Kindle Direct Publishing is Amazon’s publishing service for eBooks, which recently started offering POD books as well. And instead of operating two book printing services, they are now combining them into one. I received an email stating that my books will be automatically migrated to KDP in the next few weeks with no disruption in their availability on Amazon. Cool. Then I got a bunch more emails. Because I chose X option on Mental Contact, it will change to ‘draft’ status and removed from sale on Amazon. Because of Y option, At Fault will cost more to print in the UK. Since In the Lurch isn’t published yet, I should go ahead and do that or it will also go into ‘draft’ status and potentially mess up my launch schedule. Sigh. I actually thought it would be easy. Instead, I’ve pretty much had to update and republish all of my books so that the transition will be seamless. Although I don’t have high hopes that everything will go through without a hitch. Change is always hard, but I’m sticking with this since Amazon is the main sales avenue for books, KDP is still the most affordable option without doing a print run of 1,000+ books, and I used the free CreateSpace ISBN. I used the free ISBN. Cue widespread indie outrage. "You should always purchase your own ISBN!" So many self-published authors state this as an outright fact. ISBN is just that little number on the back of the book encoded in a barcode. Since it’s standardized, anyone can scan it and look up the book. Even those QR scanning apps will identify the title, author, and publisher (and link to an online retailer where it’s sold). By purchasing your own ISBN, you are shown as the publisher on record. It looks more professional. You’ll have the same identifier through all printers if you use multiple. It will be your own! If you don’t, then you’re a hack!! For some authors, sure, using numbers you purchased yourself makes the most sense. My problem is with those who consider using your own ISBN as the ‘right’ way and look down on those who opted for the cheaper option. 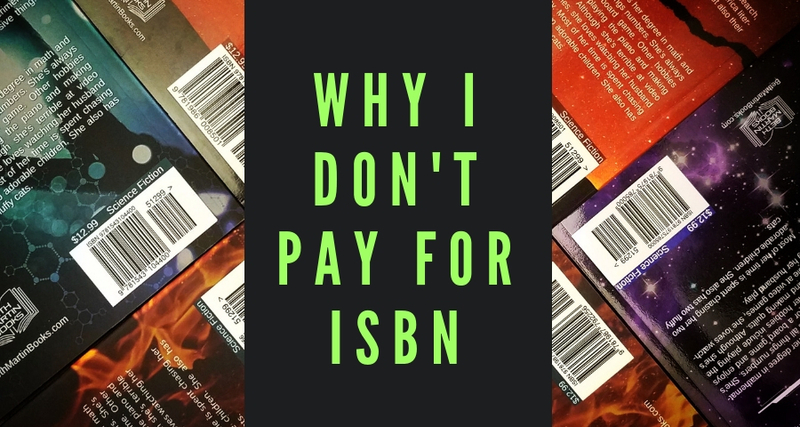 Instead of analyzing every detail of both sides of the debate, I’m going to go over the main factors of why I use the free ISBNs provided by POD companies, and why I plan on continuing to use them in the future. Bowker has a monopoly in ISBN in the United States so they can charge whatever they want. They’re only $1.50 a piece if you purchase a block of 1,000. That’s a huge upfront cost, though, and probably way more than an indie author would need in their lifetime. However, a more reasonable amount, say 10, cost $295. For a list of numbers. For that price, I’m going to make absolutely sure it’s necessary, especially if there’s another option. Many authors say that having their own publishing imprint listed as the publisher on record helps brand their book. I’ve been publishing under “Beth Martin Books” and have my little logo on the title page and back cover. Also, my name is on my books—I even use the same font for my name on all my covers. And what about the authors who are published by larger houses that put out thousands of titles every year? Having Random House listed as the publisher doesn’t help build the author’s brand. Look, I’m not prepared for a zombie apocalypse. I’m also not prepared for the largest company in the world to suddenly go bankrupt. The thing that really bugs me when people talk about the long-term impact of having a POD ISBN is that these identifiers aren’t particularly long-term. Each edition of the book will have a new number—it isn’t one and done with only one number ever associated with a title. The Harry Potter books have already had several editions, each with different ISBNs, and the variety of identifiers haven’t made the books hard to find. Do you know who else does POD? Barnes & Nobles. They also offer free ISBNs and even have the option for hardcover copies. In fact, you can purchase a hardcover of both The End of Refuge and Quality DNA on their website. I haven’t made the push to have my novels stocked in their physical stores, but if you go into one and request a copy, they’ll order it for you. I know there are other bookstores, but they’re the big one. Also, smaller bookstores are more willing to do a consignment deal with local authors. I’m not trying to impress the book industry, which seems to be the only group that actually cares about this whole charade. When looking over a copy of my book at an event, I’ve never had anyone ask who the publisher on record was or which printer manufactured my book. Only a few people have asked if my books are self-published, and when I proudly declare, “Yes they are!” I’ve only gotten positive responses. The only companies I’d like to impress with my novels are the big five. Even then, I would have to impress them with sales. If my novels make mad sales, I’d totally get offered a fat contract for printing rights with wicked royalties. Totally. If something in the future persuades me that my current ISBNs are no good and having my own is the best option, then I can make that change. It’s as simple as putting out a new edition with a new identifier.